A recent paper by Adele Morris, Brookings Senior Fellow, and Aparna Mathur, Resident Scholar with the American Enterprise Institute, examines the impacts of a potential pairing of a carbon tax with an EITC expansion to childless workers. While a price on carbon via a carbon tax is a key component to stabilizing greenhouse gases (GHGs), the fact that lower-income households spend a higher percentage of their income on energy means it could also have a negative effect on low-income communities. The researchers examined how a carbon tax would burden households differently by income and also looked at the share of revenue that would be needed to fund an EITC expansion to childless workers. Download the full report: A U.S. 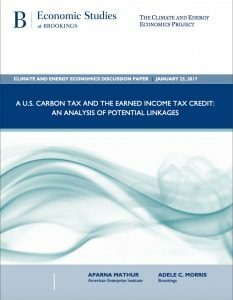 Carbon Tax and the Earned Income Tax Credit: An Analysis of Potential Linkages.